Looking for additional sources of income is always encouraged. Sometimes a person’s fulltime job isn’t satisfying financially with no or little time and energy for a 2nd part-time job. Gig economy jobs have emerged as a great alternative to make that extra bit of cash each month at your own convenience and when you feel like it. With Lyft, you can choose to drive folks around whenever you have a couple of free hours and want to make some cash. It’s quite easy, once you complete your registration process, you’ll be your own boss. Busy or don’t feel like driving? You can turn off the app and you won’t show up as available to those trying to book a trip. Whenever you have a few hours to spare, you can turn on your availability and you’ll start receiving requests for rides. You could work as much as you want. To be fair, Lyft is one of the best gig economy companies since you can get a full-time job’s salary by only working a few days each week. Join Lyft as a driver now and start making extra money! In an age where traveling and accommodation in new cities are super expensive, Airbnb has been the savior of travelers. Luckily, it’s not just good for travelers, but also for residents of a city who have spare rooms. If you’re looking to make extra money, you can always rent out a spare room in your home. It won’t cost much and will be a constant source of income, particularly if you live in a touristy city. Considering you don’t have to put in much time or effort yet the financial reward is great, renting through Airbnb is one of the best gig economy jobs out there. Join Airbnb today and turn your spare rooms into ATM machines! It’s not much of a traditional job and doesn’t really require any skills or training, but if it can be used a source of money then it qualifies as a job in our book. Through SurveyJunkie, you can get paid to provide your feedback on companies using online surveys. The company pays them to collect the data and they pay you to provide it. Most surveys are short and take less than 5 minutes to complete. The more surveys you take the more money you get. Get started with SurveyJunkie and start earning easy money online! Having to pick up your kids from basketball practice or a dance recital can disrupt a parent’s entire schedule, especially if they’re a busy person with lots of responsibilities at work. HopSkipDrive takes care of this by hiring people to pick up children and drive them around. You’re probably thinking that it doesn’t sound very safe, but HopSkipDrive is a reliable gig economy platform. The drivers are carefully vetted and all of them have clean backgrounds to ensure the safety of all children passengers. So if you’re good with kids and have enough time to drive them around, this is definitely a good side gig you should try. This is for people who have tools lying around without use. Why not rent these tools to a person who needs them and get some money in exchange? With dedicated platforms such as Toolsity or T’Work, you can do just that. Post your tools on the platforms so people can request to rent them. Both platforms enable direct interaction with the person renting your tools to make sure they are reliable and will actually return your equipment when they’re done using it. It’s incredible that we can make money these days just by renting our parking spaces. Parking Panda lets you post when your parking space will be vacant and where it is. Visitors, or even residents, of your area can then request to rent it for a specified period of time. Perhaps you didn’t expect to see this as one of the top gig economy jobs, but it sure is an easy way to make money. Want to make money part time through your car but don’t want to drive people around? The app lets you rent your car. To be clear, they’ll rent the car for a trip or vacation, you won’t be involved. Plus, you don’t need to worry about setting a rental price yourself because the app will do it for you. It calculates the rental price based on the car, location, what time of the year it is, and other factors. Potential renters are vetted by Turo so you can rest easy. Make money by renting your car with Turo! Have designer pieces that you don’t use much anymore? With Closet Collective, you can post your designer pieces that have a minimum value of $200 for rent online. You can post clothes, bags, accessories, and shoes as long as they have a minimum value of $200. If you want Closet Collective to handle listing, shipping, and even dry clean the item before it’s returned to you, you’ll only get 60% of the rental price. Alternatively, if you want to get 80% of the rental price, you can handle all that yourself. For more ideas on how to earn more, check out this extensive article on the best ways to make extra money! TaskRabbit is one of the most useful gig economy platforms for those who can do a lot of things. By signing up and creating a profile, you can receive job offers to do things like mowing the lawn, plumbing work, or simply helping a person move. As your overall rating rises and you keep getting great reviews, you’ll be able to make more money since you’ll be available for people using TaskRabbit Elite. It’s a great way to make extra money if you want to try out different jobs. Doordash is a gig economy job that lets you deliver food for money. When a person orders a meal from a restaurant and wants it delivered to their home, you’ll be there for them. Just like with all gig economy jobs, this isn’t full time. You can choose when you want to work by turning on the app and choosing to be available. Whether it’s for breakfast, lunch, or dinner, you’ll definitely find food that needs delivering. Doordash is available in over 400 cities across the United States and Canada so it’s likely to be available where you live. Dolly is for people who want a simple part-time job that doesn’t require mental effort. By signing up for Dolly, you’ll help people move. All you have to do is carry boxes and load them onto delivery trucks. In order to become a Dolly employee, you’ll have to pass a background check. You’re also going to be insured by the company. The insurance part is great because that’s the reason independent movers who can’t afford insurance don’t usually succeed. If you’ll only be lifting and carrying you can make about $15 per hour. On the other hand, if you have a truck or cargo van and can help with delivery as well then you can make $30 per hour or more. You can accept jobs that suit you according to your own schedule. On the long run it’s one of the most profitable gig economy jobs you’ll find. Upwork is arguably the largest freelancing platform there is, making it one of the largest gig economy companies in the world. By creating an Upwork account, you become a freelancer who specializes in certain fields. If you’re great at writing then you’ll be a freelance writer. Those who are great with graphics can be designers. There’s no shortage of jobs on Upwork since thousands of clients looking for someone to get the job done use the site each day. Depending on your availability, you can work as much or as little as you want. Some people find freelancing to be quite lucrative and make more money through it than they do via their full-time jobs. Don’t mind being a handyman or cleaner? Using Handy, people can hire cleaners or handymen for specific jobs at home. By joining the platform as a worker, you get to choose your own work hours and accept or refuse jobs. You can make up to $22 per hour as a cleaner and 45$ per hour as a handyman. The money you earned is deposited into your account as soon as the job is finished. It’s a great and simple way to make decent hard-earned money. By joining Avon’s group of representatives you can make lots of money. It’s not just about you selling products, it’s about hiring people to work under you. When they sell products, you get a portion of the money. Join Avon and become an Avon rep now to start making money! Sparehire is the go-to platform for investment bankers, marketing experts, and strategy consultants who want to boost their income. Small business owners who need professional help can get it by looking for these experts on Sparehire. Those interested in joining the platform as workers, however, must have at least 2 years of experience from a top company. As someone who works at Sparehire, you’ll get 75% of the payment a client sends you while Sparehire gets 25%. It’s still a sweet deal and there aren’t many gig economy companies who provide this kind of service. Are you really good at something and love to teach it? There’s no reason for you to teach it for free. You should make videos and post them online. Udemy is probably the best site that can host your videos and lessons. Not only is it massively popular so you’ll definitely have viewers, but it will also help promote your videos. With Udemy there’s some safety in knowing your videos won’t be easily downloaded and shared illegally too. If you’re passionate about something then create a teaching course. Once you’re done and the videos are uploaded, just wait and collect the money as people subscribe for your course. Going away on summer vacation for several weeks? Rent your home in order to make some cash while you’re away. Perhaps the money you make from renting your house will mitigate the financial toll of taking such a long vacation. With HomeAway you get to select when your house is available for rent, and who gets it. The app will also estimate how much you can make by renting your place through the data you give it regarding the house like how many bedrooms and bathrooms. If you find the estimated rental price to not be worth it, you can discard your idea. Of course if it turns out to be a sizeable sum, why not make money while away? Instacart lets you grocery shop and deliver these groceries to clients. It’s one of the easiest ways to make money and requires very little effort. You don’t even have to do it regularly. If you’re going grocery shopping for your own home, you can check the app and see if you can buy and deliver things for a few people. You basically do it once a week and it’s a very low risk job. With Rentah, you can rent out anything you want, whenever you want. Whether it’s a blender, a gaming controller, or a screwdriver, you can post it on Rentah. You get to set up a profile and choose how much you want to rent an item for. The platform makes it quite easy to adjust prices and the location of your items too. Renting your stuff is a great way to make money with little to no effort. There’s no better way to spend time than to spend it with lovely dogs (unless you’re afraid of them). With Rover, you get paid for spending time with dogs. Whether it’s pet-sitting, dog walking, or providing drop in visits while the owner is away for a long time, if you can take care of someone’s dog(s), you’ll get paid for it. Like with all gig economy jobs, you choose your hours. You also have access to 24/7 support and vet assistance through the app in case of an emergency. It’s a great way to spend time while adding to your income. Spare5 has tasks that take very little time to complete. The main purpose of the platform is to train AI technologies. Tasks are really as simple as adding keywords to pictures or putting videos into suitable categories. By connecting your Spare5 account to your social media, you’ll help the platform find jobs for you that suit your interests and hobbies. As you gain experience by completing more tasks, your pay will go up too. 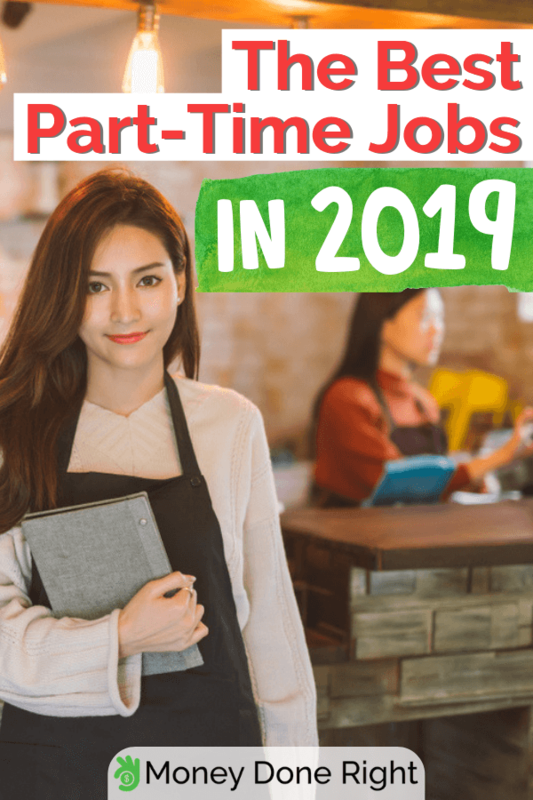 Those looking for ways to make extra money through part-time jobs should have no excuses. Most of the gig economy jobs we mentioned need nothing more than a computer/smartphone and an Internet connection. Why wait? Choose a suitable gig economy job and start making money straightaway.